Some of the biggest skin care companies in North America use the pursuit of fairer skin in their ad campaigns for products sold outside the US. Over the weekend, Dove apologized and pulled an ad it had posted on its US Facebook page for one of its body lotions. In the ad, a black woman pulls off her brown T-shirt, revealing a white woman in a cream shirt. 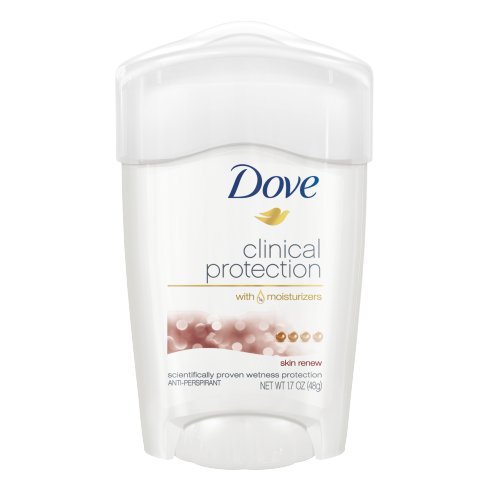 (In the full GIF, the white woman pulls her shirt off to reveal a woman with a more olive complexion, but there’s still something queasy about the campaign and its tagline, “100% Gentle cleansers.”) “We missed the mark in thoughtfully representing women of color and we regret the offense that it has caused,” representatives for Dove said on Facebook after the company pulled the ad. The controversial Dove ad (left). An ad for Nivea (right). The racial coding of these ads isn’t as blatant as “White Is Purity,” but it is representative of the way skin care companies subtly calibrate their language when trying to market whitening products. Most North Americans are familiar with lotions, toners, or scrubs that “brighten” skin, products that are supposed to reveal a version of your skin that’s more glowing and “radiant.” But those products, or products like them, are sold in different regions by the same companies with just slightly different terminology. Brightening becomes whitening, and the pursuit of radiance becomes the pursuit of fair skin. The phrasing around skin lightening products in North America isn’t different from the marketing in other countries because North Americans consumers are less racist, or because the North American beauty industry is less obsessed with whiteness as the highest form of beauty: It’s just because we’re more concerned with whether we appear racist. 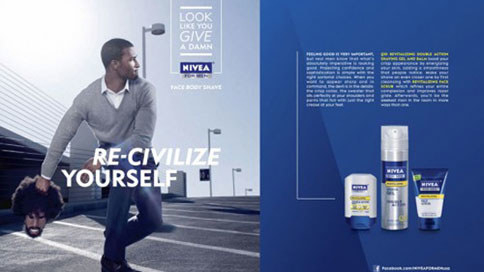 Consumers who were shocked by Nivea’s Middle East division promoting a deodorant with racist language were only surprised because they are rarely exposed to the language of beauty campaigns in countries where white people are not the majority. With these products, as in seemingly all things, our first priority isn’t dismantling our elevation of whiteness when it comes to beauty and status, but rather pretending that elevation isn’t happening at all. Whitening products aren’t a new trend — plenty of communities have history with skin bleaching or home remedies intended to lighten the skin. 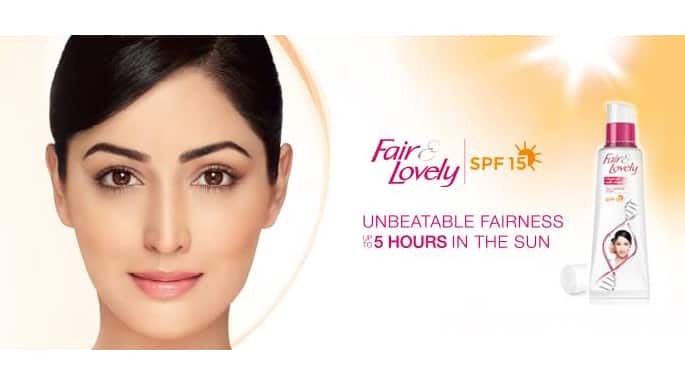 Fair & Lovely, a lightening cream primarily sold in India, has become a cultural touchpoint for many brown women. Black women are often marketed to directly by cosmetics companies that make lightening or bleaching products. Plus, communities of color often have their own “cures” for darker skin whose ingredients vary from the natural (turmeric or honey) to the possibly carcinogenic (mercury). 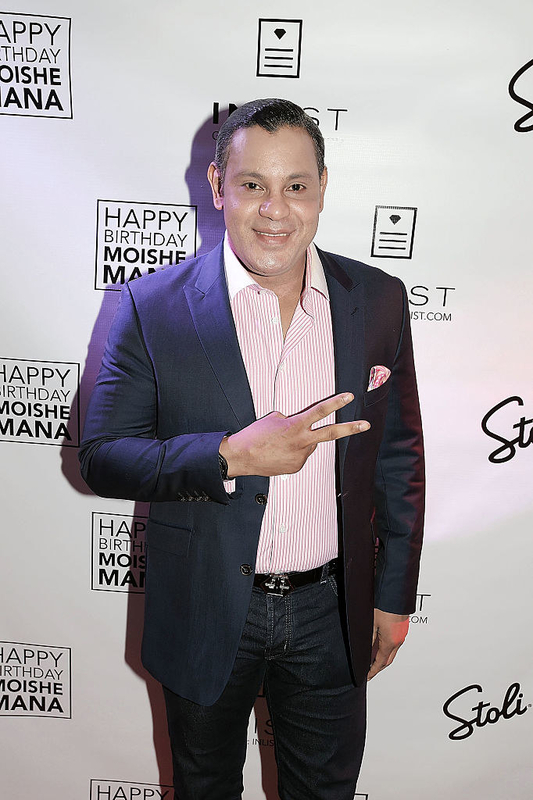 There’s also a long tradition of trying to suss out which celebrities might have bleached their skin: Sammy Sosa has undergone a very obvious change in complexion (which he admits to), Lil’ Kim’s skin is noticeably lighter (though she somewhat denies it), and — Beyhive forgive me — there are even conspiracy theories that Beyoncé is paler than she was a decade ago (which Beyoncé, of course, does not address). 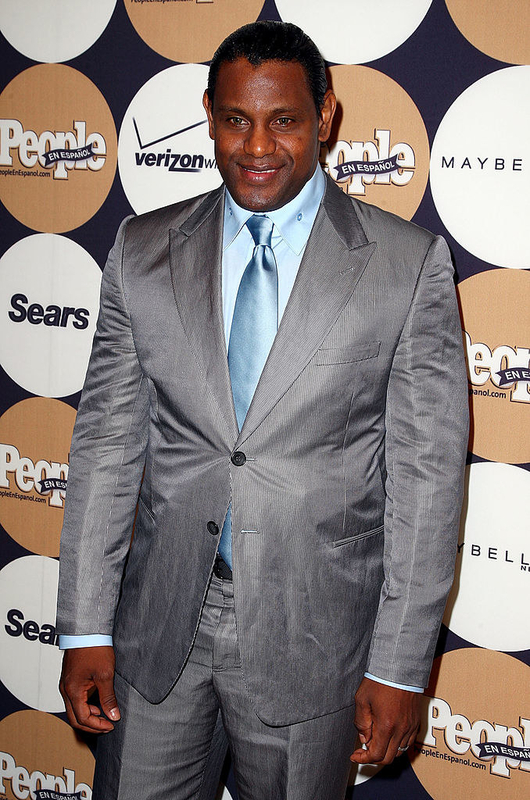 Sammy Sosa in 2009 (left) and 2016 (right). Skin bleachers often have more potent ingredients like mercury or steroids, some of which are banned in certain countries, including the US. Skin lightening or brightening products, meanwhile, are often sold over the counter, and suggest a more subtle shift in your skin tone (brighter rather than whiter) than flat-out bleaching. A lot of them are “natural” or “organic” since ingredients like citrus or liquorice root can also lighten the skin. These ingredients aren’t as potent as the ones you’d find in prescription bleachers, but they can make your skin fairer with extended use. Part of the trouble with discussing brightening, whitening, or lightening products is that because those terms aren’t clearly defined, the marketing language isn’t regulated. Dr. Rachel Nazarian, a dermatologist in Mount Sinai’s Department of Dermatology in New York, considers whether the product bleaches or lifts stains from the skin in the same way you might evaluate how stains are removed from clothes when trying to make sense of these definitions. “When you have hyperpigmentation, you can actually bleach, meaning you’re preventing and interfering with the skin’s ability to make pigment,” she says. “Lightening is a bit different where you’re not bleaching or preventing the skin from making its pigment, but what you’re trying to do is to get the basic pigment to leave a little bit faster, sort of lift the stain, but you’re not interfering with the body’s pigment mechanism.” In other words, bleaching products will make it difficult to tan, since they affect your skin’s ability to create color. With brightening or lightening products, you can still form pigment. Although skin brightening products are ubiquitous across the globe, the way those products are marketed varies widely, depending on the market or the intended consumer. Skin lightening in countries like India, the Philippines, and China is often linked to the ideas of protecting your skin from the sun, revealing a better, whiter you, and connecting paler skin with marriageability or attractiveness. The Korean market is often interested in looking “porcelain” or youthful. For black and Latinx people, marketing for skin lightening products often references hyperpigmentation of certain body parts (lips, for example) while also noting that the products don’t contain harmful chemicals, like a lot of traditional bleaching products do. Within the designation of lightening, or brightening, or even whitening, there are no real rules about what companies can or can’t say. While niche brands are perhaps more honest about the intention of these skin care products, larger companies generally lean toward euphemism in their language. They seem to be targeting both people of color who are wary of a cultural bias toward lighter skin within their communities, and white people who are maybe less familiar, and less comfortable, with their preferred cosmetics brand getting into the whitening game. Regulations vary by country, but no region is entirely immune to the health risks of the worst kinds of bleaching creams. In 2010, the New York Times reported that dermatologists across the US were seeing Hispanic and black women with severe side effects from skin lightening creams, “many with prescription-strength ingredients,” in products like Hyprogel and Fair & White. In 2015, the Ivory Coast banned skin whitening creams, products like Femme Libre, because of their potential health effects. Some of those effects are minor irritations like inflammation, redness, burning, or flaking skin. In more extreme cases, whitening creams with hydroquinone, corticosteroids, or mercury can cause hypertension, kidney or liver damage, thin skin, or — if used while pregnant — birth defects. Downplaying the true nature of these products has social ramifications, too. It allows companies to passively reinforce white ideals as beauty norms — ones we’ve had for centuries, long before beautification became its own industry — without explicitly acknowledging the benefits of perpetuating them. And in buying the products described with these euphemisms, white consumers don’t have to contend with the reality that the whiter your skin, the more beautiful you’re often considered to be. In early 20th century, women in the US began using more skin care products daily. “For the products aimed at white women, it would often be about getting rid of freckles ... getting rid of skin that looked ‘dull’ and making it look brighter,” says Susannah Walker, author of Style and Status: Selling Beauty to African American Women, 1920-1975. 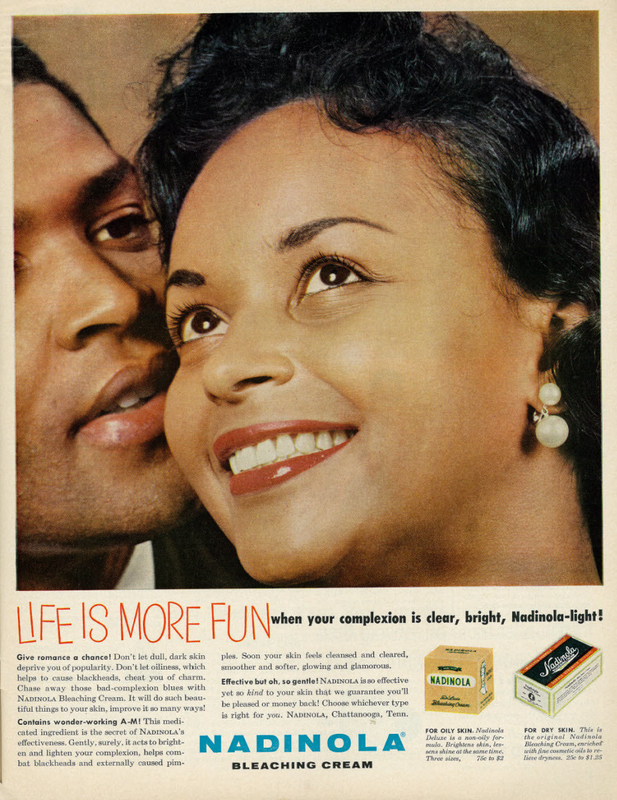 Meanwhile, black people with fairer skin, dating from slavery days, were treated better by their white masters and, later, employers, which helped create a market for skin lightening products for black people. In the early 20th century, prominent black entrepreneurs who focused on hair care for black women, like Madam C. J. Walker and Annie Malone, started getting into the skin care game. Neither was interested in getting into skin bleaching and lightening powders, but other black-owned companies did. (After Walker died in 1919, the Walker Company introduced a product called “Tan-Off.”) This perhaps led to more white-owned companies marketing directly to black people. 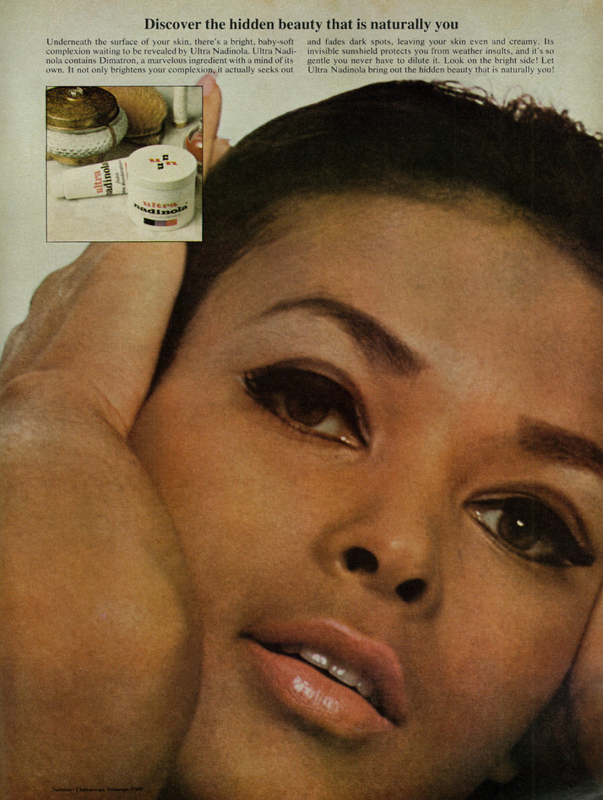 According to Pageants, Parlors, and Pretty Women: Race and Beauty in the Twentieth-Century South by Blain Roberts, Nadinola, a bleaching cream product that’s still sold today, would run advertisements in black newspapers. Ads for Nadinola over the years. During the 20th century, both black- and white-owned companies adopted language that focused on class and social standing, rather than whiteness, as the ideal. “Both types of companies, increasingly, are using a more ambiguous and complex language around the products,” Walker says. Thanks to colonialism, fairer skin still reads as a symbol of class and wealth. In the North American market, most companies still think of white women as their default clientele. “When cosmetics companies visualize who their target market is, it’s not an Asian woman or a Filipino woman. It’s a white woman. Telling a white woman to retain her whiteness, it means something different in the US,” Rondilla says. And white consumers aren’t likely to respond to a product that explicitly claims to stifle melanin production, because it’s not a real concern for them. Whitening products across the board in North America and on the other side of the world both do, however, engage with ideas of hygiene or detox. “It connects with the idea of hygiene, this idea that whiteness and cleanliness go together and that black or brownness are dirty,” says Hunter. “A lot of the old-fashioned remedies were about scrubbing the darkness out of your skin.” Hygiene advertising comes with the suggestion that darker skin is dirty and unattractive, or even that it might smell bad or cause revulsion if anyone else has to see it. Detoxing is essentially the same idea, repackaged for white women: a much nicer word that suggests you’re simply helping your body return to its natural, healthy state. The fact that North American consumers don’t see a ton of products flaunting their whitening qualities may come down to white fragility more than anything else. “No one wants to think about their beauty process as participating in legacies of white supremacy,” Rondilla says. “Race speak is only acceptable if white people can find a way out of their privilege.” Ultimately, white people are uncomfortable with being reminded that beauty standards are still controlled by concepts of whiteness, regardless of your race. You’re still more likely to be considered attractive or get that job you want if you’re fairer skinned, and white consumers aren’t the ones who actually suffer from that reality. The idea that it’s one thing to be brown or tan but another (worse) thing to be black is a real anxiety for a lot of South Asian communities. The language in advertising there may be less delicate, but even when people of color see cosmetics ads marketed to white people, they can read the code. 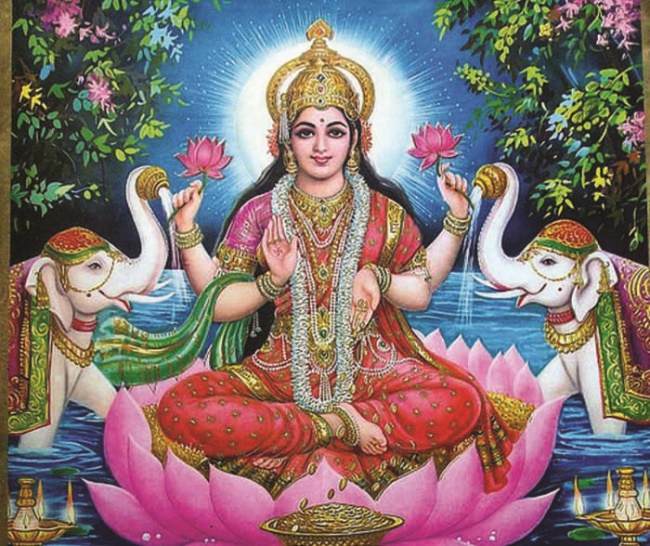 “A lot of South Asians or other folks of color, when they see the word brightening, they know what that means automatically. It’s close enough without offending white people,” says Thiyagarajah. But the public controversies around marketing like this are sure to keep bubbling up: The internet has changed companies’ abilities to control their own message by region. The barrier between what’s sold in India and what’s sold in the US — and how — is far more permeable. Think back to 2016, when a Lancôme Blanc Expert ad campaign featuring Emma Watson went viral: Plenty of people on Facebook were furious that the actress was promoting what turned out to be a skin whitener. But the campaign featuring Watson — and to be clear, celebrities often don’t have control over the language used in different countries when they sign on for beauty campaigns — was specifically targeted to women in Asian countries. (Lancôme called the Blanc Expert range “the No. 1 whitening brand in Asia.”) The spillover when the campaign went viral in the US, five years after it initially launched, showed how tricky it can be for cosmetics companies to fully control their own messaging now. A 2011 Lancôme ad for a skin lightening product featuring Emma Watson. Indeed, Unilever and similar beauty companies sell these products largely because there’s still a market for them around the world. The availability of skin brightening products proves that whiteness is still considered the ideal. And the way advertising language in North America obscures this fact shows how unwilling North Americans are to acknowledge their participation in it. Companies like Nivea have been quick to apologize when an overseas ad is deemed racist in the US, but other than frustrated consumers on Twitter, there’s little internal discussion about the forces that led these companies to draft it to begin with.